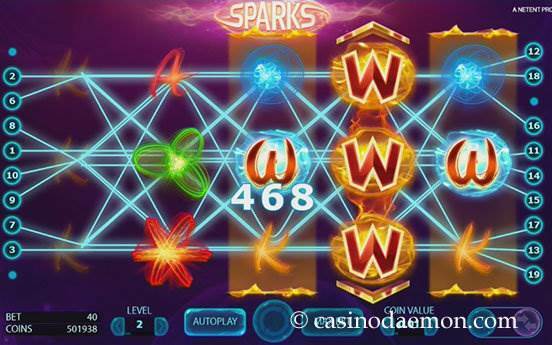 The Netent slot Sparks is a relatively simple game that lets players chose to play it with one-way or both-way-wins. The game has a tranquil atmosphere and nicely animated symbols showing what looks like energy or light patterns. The graphics have a colourful yet warm look. You can change the win-ways at the bottom right corner, and changing the game setting will also change the background and atmosphere. The game doesn't have a whole lot of special features, there are no bonus game or free spins, but it has the expanding cloning wilds that will create great winning combinations regularly. The theoretical return to player depends on the selected play mode and is 96.54% with both ways and 96.56% with one-way-wins. You can also play the slot on mobile devices, such as iOS or Android smartphones or tablets. 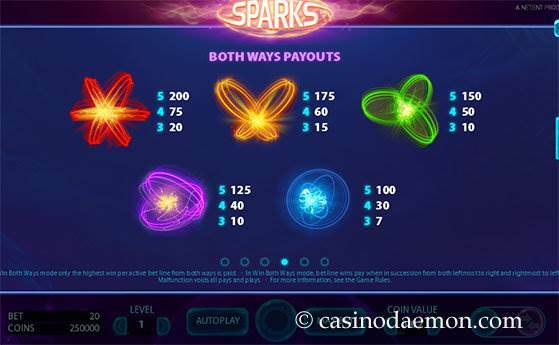 Here you can play Sparks for free and try the game without obligation. It is also possible to play the game for real money at one of the casinos listed on this page. Sparks has a special symbol called Expanding Cloning Wild that can appear on reels 2 and 4. This wild symbol replaces other symbols for winning combinations, and it can also expand up or down, or in both directions of the reel. The wild symbol then clones the symbols from the reel left to it onto the reel right to it. This means that you will always have a combination of at least 3 symbols when the wild appears. The best case scenario is both wild reels 2 and 4, which means that you would get a symbol combination of 5 symbols. The expanding cloning wild symbol appears regularly on the reels, and it is a lot of fun to watch the game. However, it doesn't have any other special features, which is a little disappointing. 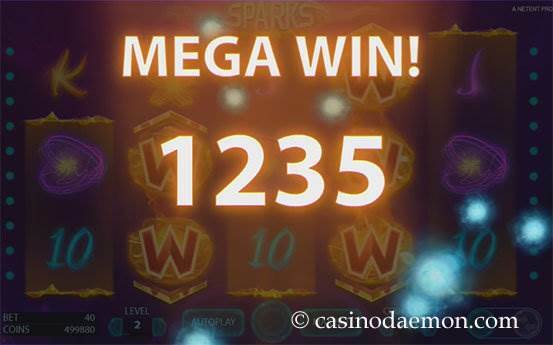 The variance of the game is low to medium, as you will regularly win smaller and medium sized amounts with the special expanding wild. Every now and then you will also win a larger amount. It is easy to play the game for a while without loosing your money too quickly. 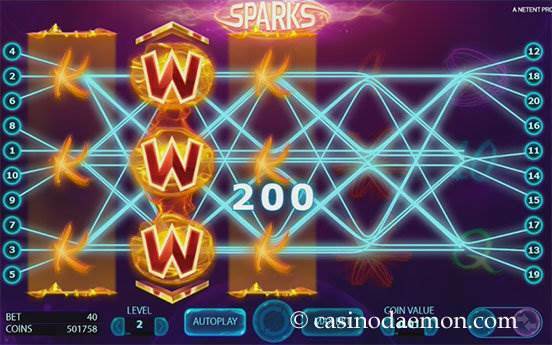 The Netent slot Sparks is a 5-reel slot with 20 pay-lines. The player can select to play one-way or both ways. Playing both ways doubles the stake. The coin values can range from between 0.01 up to 2 €/£/$, and you can play up to 10 coins per line. The minimum stake is therefore 0.20 €/£/$ and the maximum you can play in one round is 400 €/£/$.